In my last post about flattened diamonds, I talked about the problem of dealing with a diamond when the desired stitch pattern is centered around a single stitch. The diamonds I’ve been working with so far have a rectangle in the middle based on an even number of stitches. When I place a simple chevron on such a diamond, it looks like this, which bothers my mirror symmetry-loving brain, especially when designing a shawl. The actual pattern repeat works out just fine, mind you! But there is the necessity of including an extra stitch on the right-hand side of each row. My first thought about this was to make the center repeat an odd number of stitches, and make one arm of the diamond one stitch longer than the other. This certainly tiles, but it makes the increases at each edge peculiar. My second thought makes use of 3-to-2 decreases and the principle that the decrease corresponding to a particular increase can be on a completely different row. 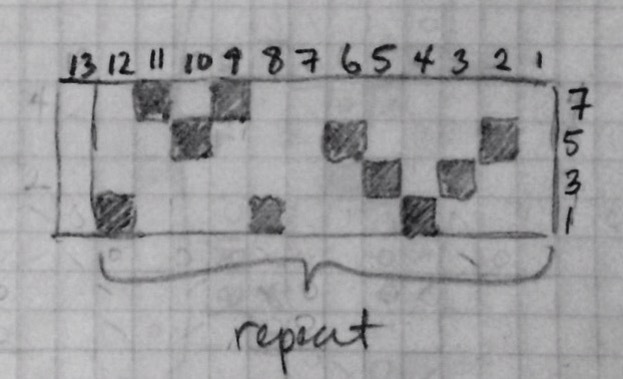 (On this sketchy chart, the dark squares are grey-no-stitch squares.) This tiles nicely, keeps the increases at each edge consistent, and makes the design process easier for me. It won’t work for all stitch patterns, however. But I do like it. So my third thought is probably too complicated for a final pattern chart, but it helps satisfy my mirror symmetry cravings in the design process. The arrow points at the spine of the shawl. The central column of diamonds has an extra column up the middle, so the chevrons can be centered on that spine. The diamonds on each side are based on an even number – the chevron sits slightly to the left in the diamonds that are on the right-hand side of the pattern, and vice versa. Note that in the end, once the diamond outlines are removed, this produces the same overall rectangular stitch pattern as the second chart in this post: a repeat of 12 + 1 stitches and 8 rows. But if designing a crescent shawl, I think the third thought works best. This is the basic method I used to make the Galaxite stitch pattern, though I’m going to use a much shorter word to make things quicker to explain. When I posted Galaxite on Saturday, I wrote in passing about using a tiled flattened diamond to create the stitch pattern. This post goes into more detail about how this structure was created. Crescent-shaped shawls have been popular among knitter and crocheters for several years now. The first such shawl I remember seeing was Annis, which caught a lot of people’s attention. A lot of other crescents used the same basic method (the body done with short rows, and the fancy edge knit straight), but designers started branching out very quickly, finding a variety of ways to make a crescent shape. Last winter I knit Sacre Coeur, which uses a very different method, which I found fascinating and unexpected. Its designer, Nim Teasdale, will be the first to tell you that she didn’t invent it (at least, that’s what she said when I asked), though I think she does an excellent job of working with it. I don’t know an exact name for the style (if you do, please comment! ), but it seems to be popular at the moment: one advantage to it aside from its beauty is that the shape can be worked until the knitter runs out of yarn or decides they’re done. The method starts with casting on a small number of stitches, then increasing three stitches at each edge over two rows, while putting whatever stitches one likes between the edges. When blocking, the bound-off edge is curved around, while the two selvedges are blocked out as straight as possible.